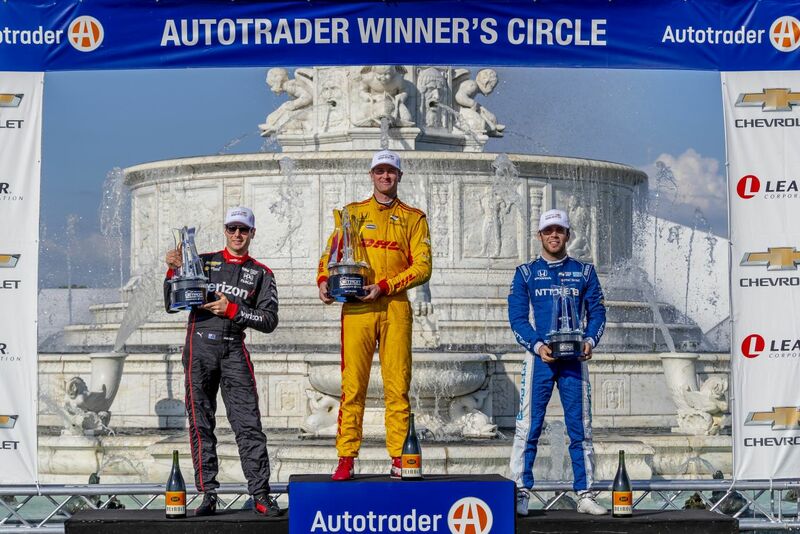 Ed Jones had promised to come back ‘stronger’ after a hefty impact with the wall prematurely curtailed his Indianapolis 500 bid seven days earlier, and the talented Dubai, UAE-born ace duly delivered in Detroit last weekend (2/3 June), as he sped to his second podium of the season and the third top three finish of his fledgling and increasingly impressive Verizon IndyCar Series career. 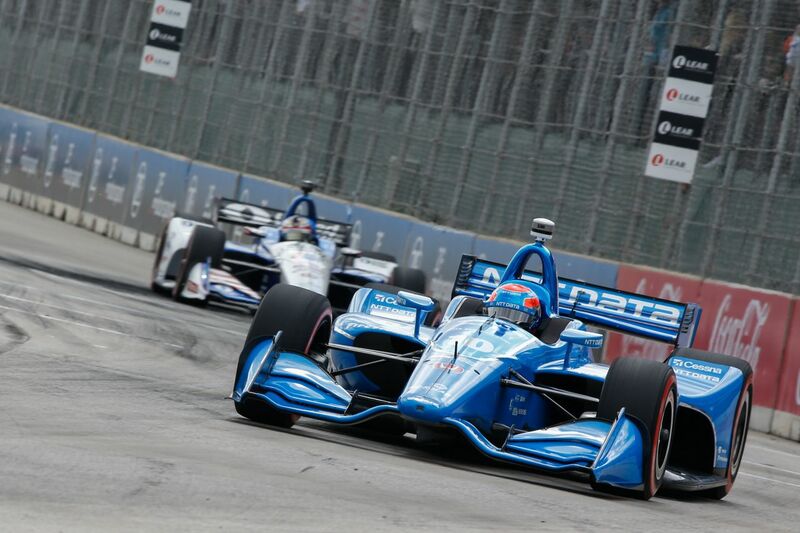 As the bumpiest and most physically gruelling circuit on the IndyCar calendar, the Raceway at Belle Isle Park was arguably the toughest place to return from an accident that had briefly left Jones hospitalised. 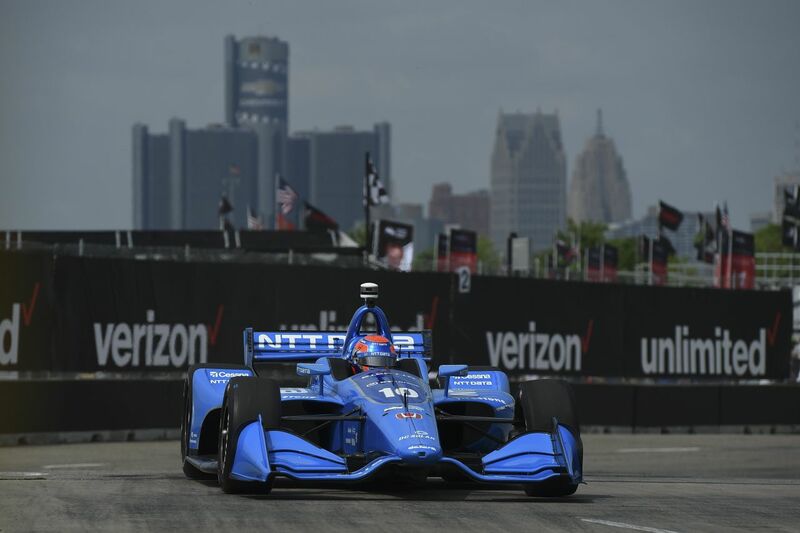 What’s more, the Dual in Detroit is the only double-header on the 2018 schedule, with a race each day, and the new-spec car introduced this year requires even more manhandling to coax a competitive lap time out of it around the punishing 2.35-mile, 14-turn lap – without the luxury of power steering. Saying that, the 2017 IndyCar ‘Rookie of the Year’ had claimed a top ten finish at the temporary Michigan street course last season, and after working his way methodically through Saturday’s two free practice sessions behind the wheel of his 720bhp Dallara-Honda single-seater, he put Chip Ganassi Racing’s No.10 NTT Data entry 11th on the grid for the first race amongst the 23 high-calibre contenders – ahead of ultra-experienced big-hitters Simon Pagenaud, Josef Newgarden and Sébastien Bourdais, title-winners all three. Immediately going on the attack when the green flag dropped, Jones soon advanced into the top ten and latched onto the back of a multi-car scrap over fifth as he lapped faster than the leader in the early stages. Making his softer-compound, less durable red sidewall tyres last all the way to lap 25, he had risen as high as third by the time he peeled into the pits to switch to the ‘primary’ black-sidewall rubber, betraying no ill-effects from his Indianapolis misfortune. After rejoining in ninth, during his second stint, the series sophomore chased down the battle over fourth before pitting again with 24 laps remaining. 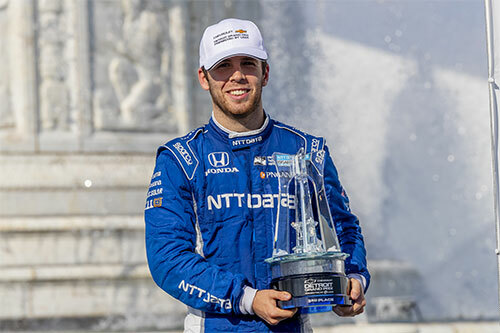 A brace of late safety car interventions subsequently concertinaed the pack together, and Jones grittily defended his position from former champion and recent Indy 500 winner Will Power and reigning title-holder Josef Newgarden to secure a strong sixth place at the chequered flag. 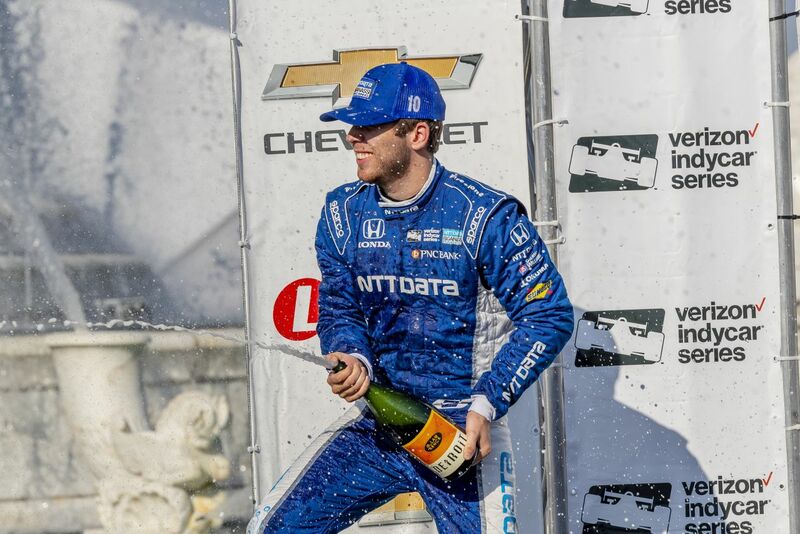 The next day dawned wet, but the 2016 Indy Lights Champion demonstrated his versatility and all-weather prowess by scything through the spray in qualifying to seal a career-high fourth on the grid. The track dried out in time for the race, and Jones made an excellent start to pinch third from Power, only for a shuffle later around the opening lap to relegate him to sixth. Recovering to fourth as the first pit-stop phase began, he caught and passed Dixon – the most successful driver in the current field – on lap 13 before pulling away and zeroing in on Power in second as he again set the pace amongst the front-runners. 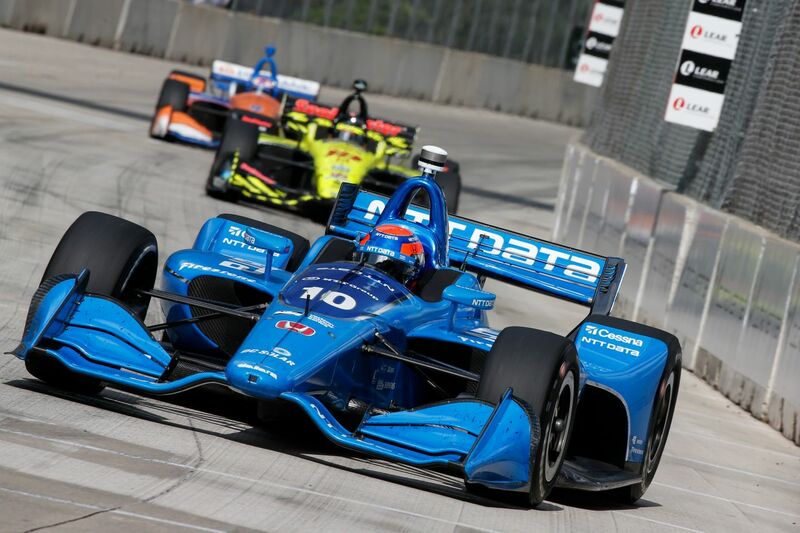 Following his own pit visit, the 23-year-old Brit was back up to third by mid-distance as the various strategies played out, conceding just a single position to eventual winner and 2012 series champion Ryan Hunter-Reay after the final round of stops. He regained the place, however, when leader Alexander Rossi ran off-track with six laps to go, thereafter maintaining the pressure on Power – closing to barely a second adrift of his quarry – while simultaneously fending off the ever-present Dixon behind. Defeating his four-time title-winning team-mate in a straight fight, third position equalled Jones’ career-best at the fiercely-disputed pinnacle of US open-wheel competition and vaulted him from 18th up to 12th in the chase for the coveted crown ahead of a return to oval competition this weekend, under the floodlights of Texas Motor Speedway (Saturday, 9 June). 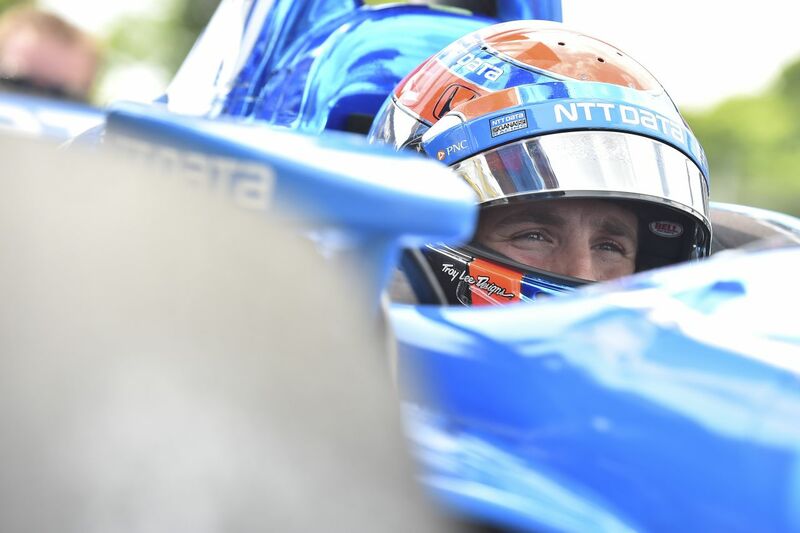 “Another brilliant day for the NTT Data team,” enthused the former European F3 Open Champion, who is being coached this year by multiple IndyCar title-holder and Indy 500 winner Dario Franchitti. “The guys really did a great job with the car over the weekend. We started off a bit slow, but the important thing is that we improved with every session and earned our way to the podium. “We had a really good qualifying in tricky conditions on Sunday; I wasn’t sure how the car was going to feel in the wet initially, and it was pretty sketchy for the first few laps but once I got a handle on it, I had a lot of fun out there. 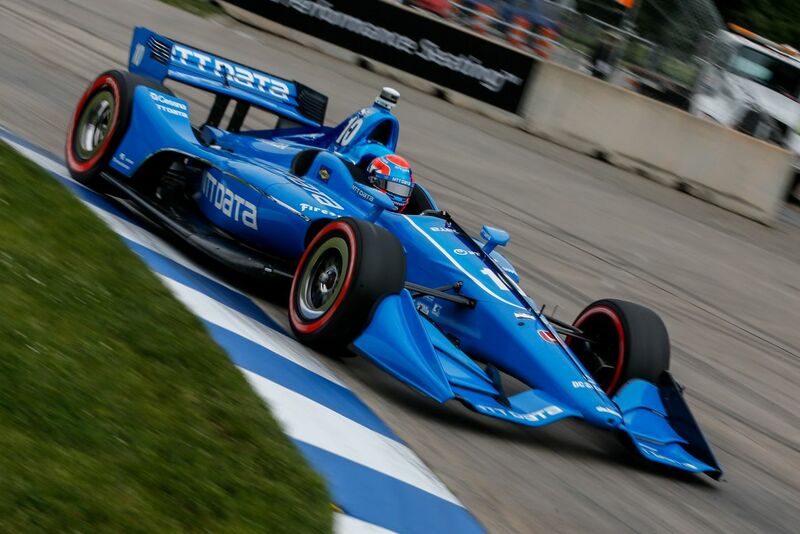 That said, the No.10 NTT Data car was awesome in the dry and we wanted a dry race after Scott’s amazing win on Saturday.